If you’re considering selling your home, or just thinking about ways to add value to your home this Spring, consider the benefits of curb appeal. After all, it’s the first impression that someone will have of your home, so it’s beneficial to put some time and energy into improving its outward appearance! Projects can range from quick and easy to time-consuming and costly, but any effort you make will improve the look of your home. Well, maybe not literally! But taking the time to fix up your driveway and walkways are key when it comes to welcoming guests and providing a positive impression of your home. If you have a concrete sidewalk and driveway, sweep and power wash to remove caked-on dirt and grime. If you do not have a paved driveway or sidewalk and would like to increase your home’s value, consider adding bricks, pavers, pebbles, or even specially designed stamped concrete to create additional curb appeal for your home. When someone walks up to your home, the first thing they’ll notice is your entryway. Create an inviting space by adding a potted flower or two, a welcome mat, and maybe hang a seasonal wreath on the front door. If you’re feeling particularly ambitious, consider repainting or refinishing the trim around the door and maybe even the door itself. Perhaps paint the door a fresh color that will add personality to your home. One of the simplest things you can do to improve the look of your home is to tidy up the exterior. Clean the windows, power wash the siding to remove mildew, and sweep cobwebs down from the corners. These are easy fixes that can make a huge impression on visitors - as well as potential buyers, if you’re planning to sell! Spring is the perfect time of year to add some florals to your front yard; after all, everything is in bloom! If you don’t plan to spend a lot of time maintaining your landscaping, then be sure to select low maintenance plants and shrubbery to add some color to your yard. A lush, green lawn can do wonders for adding curb appeal to your home. You don’t have to go all out and install sod, though - just be sure to get on a schedule of planting grass seed, watering the lawn, and adding fertilizer with weed control as needed in order to maintain healthy turf. A freshly mowed lawn can also go a long way, so be sure to cut grass before having guests or potential buyers stop by! Having the right tools helps. Our friends at STIHL have a variety of trimmers and edgers, as well as hand tools, and even a battery powered lawnmower. Taking the time to spruce up your home’s exterior can drastically increase its curb appeal and draw in potential buyers who want to see more of your home, if you’re hoping to sell. Either way, the benefits you’ll gain from putting in a little bit of sweat equity makes the project well worth your time! 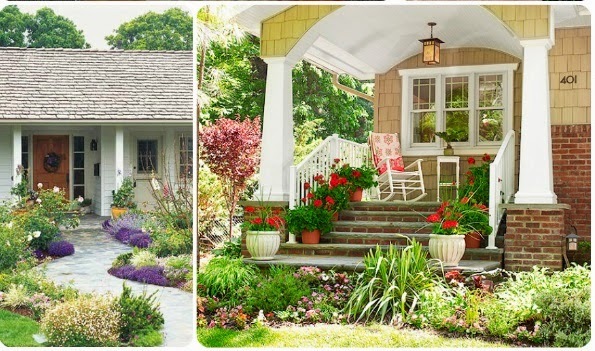 Be sure to visit the Homes.com Idea Gallery for more curb appeal tips and DIY project ideas.